Welcome to Planck at ISDC ! Access the list of Planck published papers provided on the ESA site. 2015-02-05: ESA's Planck Legacy Archive (PLA) is provided as a new web-based interface replacing since 2 December 2014 the previous Java-based one. It contains now the whole mission data in temperature and polarization. All the previous data products (all-sky images, catalogs, etc.) have been updated. 2013-03-21: ESA's Planck Legacy Archive (PLA) is a Java applet to access the maps of the sky provided for the first 15.5 months of the Planck operations. 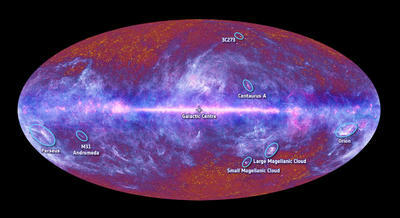 It notably includes full-sky intensity maps at all nine Planck frequencies, maps of foregrounds components at high resolution, and the Cosmic Microwave Background fluctuations at unprecedented angular resolution. Angular power spectra and cosmological parameter grids are also provided, as well as the Planck Catalogue of Compact Sources and the Planck Sunyaev-Zel'dovich clusters catalogue. 2011-01-11: The Planck Early Release Compact Source Catalogue (ERCSC) is a set of catalogues released on 11 January 2011 containing more than about 15'000 compact (point-like or slightly extended) sources detected in the first all-sky survey of Planck. The catalogues can be accessed in an interactive way both from ESA (Java applet) and NASA/IPAC (IRSA WWW tool). A very convenient dditional tool to extract spectra of Planck sources is to use ISDC's HEAVENS WWW interface. Planck is a mission of the science program of the European Space Agency (ESA). It was launched in conjunction with another satellite, Herschel, by an Ariane 5 rocket on 14 May 2009. The main scientific objective of the Planck mission is the detailed study of cosmic microwave background (CMB), radiation emitted just 380 000 years after the Big Bang. This first light of the universe reaches us from all directions of space. In fact, the whole universe is bathed in this primordial light that was shifted from the visible to millimeter and radio waves because of the continued expansion of the universe. This radiation emitted 13.7 billion years ago - the age of the universe - is a key element in cosmology, the study of the universe as a whole. It tells us about the fundamental constituents of the universe and its evolution from the Big Bang to the formation of the first galaxies and stars. The ISDC data centre for astrophysics located in Ecogia, Versoix, contributes since the end of 2001 to Planck mission. Its task is to develop and provide the software for the first level of the data processing for one of the two Planck instruments: the Low-Frequency Instrument (LFI). The system developed at the ISDC has been installed at the LFI Data Processing Center (DPC) in Trieste, Italy. Since Planck's launch, the software is smoothly and countinously running at the DPC to receive and treate the daily scientific data and housekeeping data used to control the health of the instrument. Part of the system is also installed at the Mission Operations Center (MOC) in Darmstadt, Germany. The scientific interest for the Planck mission in Geneva is, firstly, the study of the CMB and its implications for theoretical models describing the origin and evolution of the universe. This research is conducted by Martin Kunz and several collaborators in the Cosmology group of the department of theoretical physics of the University of Geneva. And, also, to study the powerful jets ejected by highly variable active galaxies called blazars. Marc Türler at the ISDC is co-leader of the Planck research group on foreground blazars.